BLACKOUT! is a fantastic foray into my least favorite genre. Somehow, some way, Disney Interactive made a match 3 game that I absolutely can't put down. Ask me a week ago for a list of the top 5 game genres that I wish would go away and I would say, match 3, match 3, match 3, match 3, and match 3… in that order. The genre is so overdone that I have a hard time even stomaching the thought of playing another match 3 game. I got word a while ago that a new game from Disney Interactive, a match 3 game, was very well done and I scoffed. After I gagged a bit, splashed some water on my face, and grabbed a drink, I got to playing BLACKOUT!. After a solid week of playing, I have quickly graduated from naysayer to recovering addict. I was waking up in the morning to a quick level or two, fitting in half a level or so in the bathroom, even playing while walking my dog. At my girlfriends request, I have given up playing BLACKOUT! as of last night because it takes too much of my time and attention. There's really no way around it, you will have enjoy playing blackout, even if you aren't a fan of the genre. The game works with the basic match 3 premise in tact… you must match strings of same colored crystals together to essentially win. Instead of a normal, boring board though, there is a large board that you must scroll around with all sorts of things going on. Also, instead of a simple high score system, the game is divided into levels which give the typical match 3 drab some purpose. Each map starts with a main light source, and with it you are to move the light to power other light sources by drilling through the ground by matching crystals which causes them to explode. To impede your progress, you must race the expanding darkness (which you can push back with certain powerups and by matching long strings) and crystal sapping creatures which you have to physically knock off the board. What makes BLACKOUT! so great, other than the level structure and the sheer amount of gaming variety, is the obvious effort put into perfecting the intangibles. With the large map structure, my first worry was that scrolling around the map would become a tedious ordeal. The system in place isn't perfect, but it does allow you to use a two finger scroll method or a touch on the edge of the screen method. The two finger style is definitely more exact, but for speed, I tend to touch on the edge of the screen. Typically the game detects my need for movement, but every once in awhile I blow up strings of crystals by accident. Another intangible that is important, arguably more important than the rest, is the graphics. I didn't expect any kind of graphical miracle when I was starting BLACKOUT!, and it certainly isn't, but the graphics do work quite well. The opening menu is laid out well, as well as the in between level screens where the city slowly lights up with each level completed. The in game graphics also work well, although there really isn't much that you can do with a game concept so simple. Overall, I'd say that BLACKOUT! 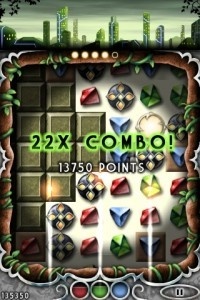 is a definite winner, and certainly is a must buy game if you like puzzle games of any kind. Being previously digested with the match 3 genre, I was shocked to find the gameplay to be as enjoyable as it was. There is certainly enough gameplay variety, as well as sheer amounts of levels, to keep you entertained for quite a long time. For the not so insane price of $2.99, less than the price of a #3 at In-n-Out Burger, you will love your iPhone just a little bit more. Tagged With: Match-3, $2.99, Disney Interactive, BLACKOUT!